Our new 5 Series flashlights feature flood to spot technology: The flood position projects a wide beam to illuminate your work area or use the spot beam for a long distance focused beam. Get the industry’s first tail switch with embedded battery status indicator to stop guessing in the dark. 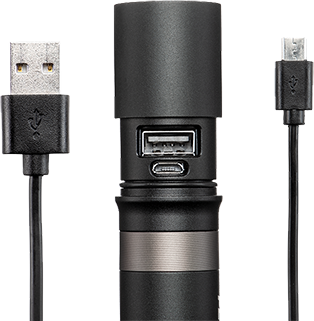 Also, with the 5050R’s built in USB (Output) and Micro USB (Input) ports, you’ll get a full charge for your flashlight or emergency back-up power for smart phones and other electronics. Reload the 5000, 5010 and 5020 flashlights with fresh alkaline batteries to see the job through. Low, medium, high, flashing or boost mode options let you switch to the best light intensity, from low lumens that are easy on the eyes when up close, to super-bright intensity for reaching way out in the dark. And with the type II hard anodized finish, the 5 Series flashlights are as tough as they look. Slim design with tough steel clip, mounts to pockets or fits in tight spots for quick access. Get the best of both worlds. The 5010 is our medium sized flashlight that gives you the lumens, run time and size of the 5000 slim design and the juggernaut performance of the 5050R flashlight. When you need extra beam distance, go with the 5020 flashlight. With up to 250 meters of beam distance and up to 586 lumens of LED brightness, you’ll have enough light to see the full length of your facility. Get power for extra long shifts and your smartphone. Recharge the 5050R by connecting directly to its Micro USB port and get up to 40 hrs of runtime (on low power setting). The 5050R doubles as a portable charger (or power bank) for your smart phone with a USB power output. The 5050R: it's our rechargeable option with flood to spot beam technology.